As we approach the new year, we are very excited to roll out another coffee from our current list of fresh crops from Africa - Kenya, our first from the country. We have always been fans of Kenyan coffee, not only because of its unique flavor characteristics, but also because the beans are generally of high quality. This country has great altitudes, climate, and soil, and its varietals have adapted to the local growing conditions and have excellent cup quality. The coffees are truly unique and recognizable in flavor, and the coffee sector has developed a structure to maintain quality as well as traceability. 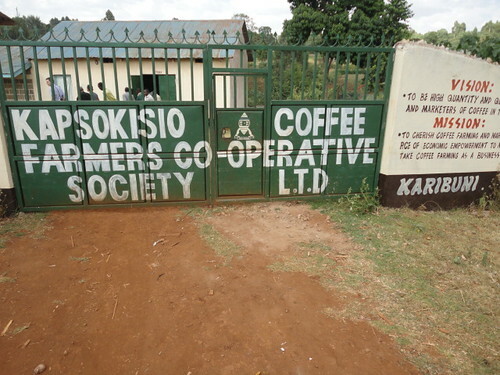 The new coffee is from the Kapsokisio Factory and Cooperative Society, which lies on the slopes of Mt. Elgon in western Kenya on the border of Uganda. This region is not as well known as Central Kenya, but has a huge potential for producing coffee of great quality. In the past, coffee farming was adversely affected by frequent clan fighting in the area but now, it has cooled down and farmers are going back to their farms. Producers: About 800 -1000 smallholders in the surrounding areas deliver cherries to the wet mill. Process: All coffees are pulped, dry fermented, washed, soaked and sundried. Cherries are hand-sorted for unripe and overripe by the farmers before they go in to production. The cherries are then put through a pulping machine,which removes the skin and pulp. The coffees are graded by density into 3 grades by the pulper. Grade 1 and 2 goes separately to fermentation. Grade 3 is considered low grade. The coffee is then fermented in painted concrete tanks without water for 20 – 30 hours to remove the mucilage. After fermentation, the coffees are washed. They are again graded by density in washing channels and are left to soak under clean water for 16-18 hours. After soaking, the coffee is sun-dried up to 21 days on African drying beds. Coffees are covered in plastic during midday and at night. Tasting notes: Red berries and hints of floral aromas. Berries and blackcurrant-like acidity profile. Light and delicate with a juicy finish. This coffee is up on our retail racks and we love brewing it with the Kalita wave dripper. Pick up a bag to brew yourself a fruity cup for a fruitful year!